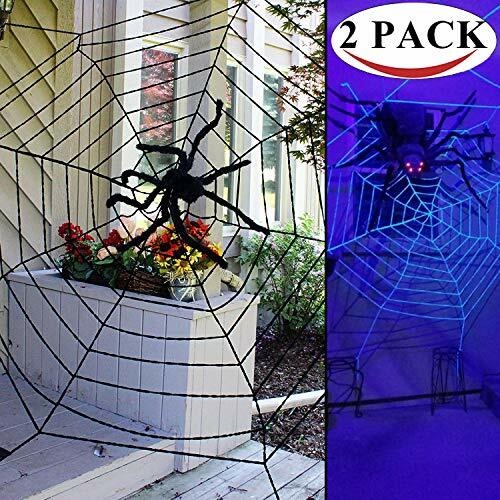 Includes 2 Pack Terrifying Halloween Mega Spider Web in Round Shape (9 ft Diameter). 1 Black and 1 White. Realistic Fuzzy Ropes. Same Look as the Real Spider Webs! The spider net is a great decoration to your house or yard in Halloween; it looks great inside a room window or door or perhaps front porch or yard, creating strong Halloween atmosphere to your house. Super Durable. Long Lasting. Made of Polyester Blend to Survive Extreme Weather. Super Value Pack for Halloween Decoration. Perfect for Halloween party decor, kids\' spider themed birthday party,haunted house decoration, or as photo background, bar nightclub decorations.